Finding movies like The House With a Clock In Its Walls is definitely a challenge, since it’s such a unique concept. In a world of remakes and reboots, this original Jack Black fantasy film definitely stands out from the crowd. Still, if you’re craving something similar while you’re waiting for the September 21st release date, we’ve got you covered! Check out these 10 flicks that range from family-friendly fun to horrifying horror! The House With a Clock In Its Walls is sure to be a hit when it’s released in theaters next month. It not only features a great cast, including Cate Blanchett, Jack Black and Kyle MacLachlan, but it also features the secret world of warlocks and witches! The movie is based on the 1973 novel, of the same name, by John Bellairs. The House With a Clock In Its Walls will be released in theaters on September 21, 2018. Sign up for a Fandango Fan Alert so you can buy tickets ahead of time! Here are some movies like The House With a Clock In Its Walls, featuring fantasy and horror movie genres. The Haunted Mansion is a 2003 comedy, fantasy, horror movie that is based on The Haunted Mansion ride located at Disneyland Park, Tokyo Disneyland and Walt Disney World. The movie centers on Jim Evers (Eddie Murphy), his wife Sara (Marsha Thomason) and their children, Michael (Marc John Jefferies) and Megan (Aree Davis). Jim, who is a realtor trying to sell an old dilapidated house, and his family discover the old house has numerous ghosts as residents. Although it only received a 5/10 on IMDB and a 13% on Rotten Tomatoes, I thought it was a fun movie to watch if you’re just looking for something entertaining that doesn’t require much thought. Mirrormask is a 2005 fantasy movie that revolves around Helena Campbell (Stephanie Leonidas), who finds herself trapped in a fantasy world. She is tasked with finding a fabled charm, known as the Mirror Mask, so she can save The Queen of Light and return home. The movie is based on a Neil Gaiman novel, and Gaiman actually wrote the teleplay, too. Although it didn’t really have any big names, the movie still did well with fans. It scored a 6.9/10 on IMDB. Nanny McPhee is a 2005 family fantasy movie that is based on the 3-book series, Nurse Matilda , by Christianna Brand. It is the prequel to the 2010- Nanny McPhee Returns. Nanny McPhee (Emma Thompson), an immortal witch, lands a job as a nanny for the widowed Cedric Brown (Colin Firth) and his 7 unruly children. In the beginning, the children are not exactly fond of their new nanny, which leads to Nanny McPhee using her magical power to get the children to behave. Nanny McPhee was well-received by fans, scoring a higher-than-average 6.6/10 on IMDB and 73% on Rotten Tomatoes. The Skeleton Key is a 2005 drama, horror, mystery movie that focuses on Caroline Ellis (Kate Hudson), a hospice nurse who takes a job at a plantation home. She soon discovers that the homeowners, Benjamin Devereaux (John Hurt) and his wife, Violet (Gena Rowlands) are members of a voodoo cult and that the house has some ghostly residents. This is definitely one of the creepiest movies like A House with a Clock in its Walls, it gave me chills! IMDB reviewers definitely liked this one better than Rotten Tomato critics! It scored 6.5/10 on IMDB and a lowly 38% on RT. Stardust is a 2007 family fantasy movie that is based on the 1999 novel, of the same name, by Neil Gaiman . The movie follows Tristan Thorn (Charlie Cox), who ventures on a journey into a magical fantasy kingdom, so he can retrieve a fallen star to give to his true love, Victoria Forester (Sienna Miller). The film also stars Claire Danes & Michelle Pfeiffer. Does the narrator sound familiar? It’s Ian McKellen, one of the greatest actors of all time! Critics agree with me that this is a great flick! It managed a 7.7/10 on IMDB and 76% on RT. Don’t Be Afraid of the Dark is a 2010 fantasy, horror movie that is a remake of the 1973 made-for-television movie, of the same name. Sally Hurst (Bailee Madison) is sent to live with her father, Alex Hurst (Guy Pearce) and his girlfriend, Kim Raphael (Katie Holmes). It doesn’t take long for Sally to start seeing hostile creatures emerging from a sealed ash pit in the basement. If you’re wondering where you’ve seen Bailee before, she played young Snow White on Once Upon a Time, and she currently plays Grace in The Good Witch. Hugo is a 2011 adventure, fantasy, drama movie that is based on the 2007 book, The Invention of Hugo Cabret , by Brian Selznick. 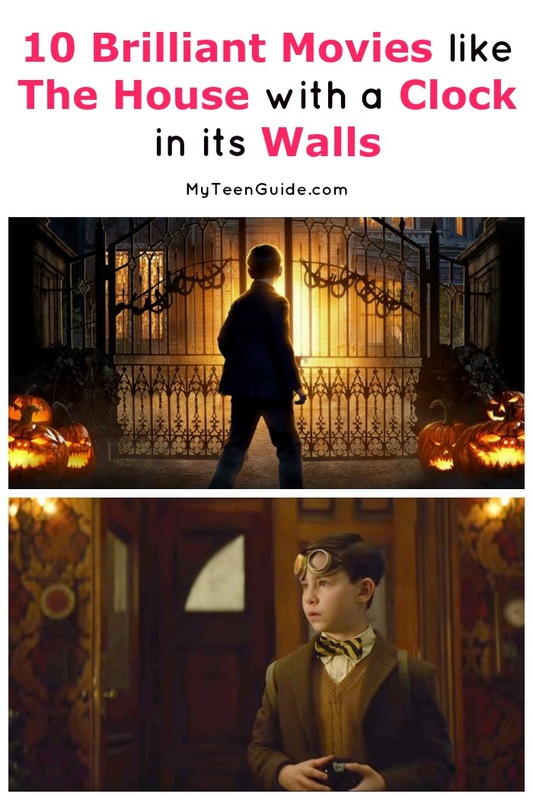 The movie centers on Hugo Cabret (Asa Butterfield), a young orphan who lives inside the walls of a train station. Hugo soon finds himself engaged in a mystery involving his late-father and a broken automaton he was trying to repair. Of all the movies like A House with a Clock in its Walls, this one is probably the most similar. This movie did better with Rotten Tomato critics, scoring an incredible 94%, versus 7.5/10 on IMDB. The Woman in Black is a 2012 drama, fantasy, horror movie that is based on the 1983 novel, of the same name, by Susan Hill . The movie focuses on Arthur Kipps (Daniel Radcliffe), a young lawyer who heads off to a remote village to collect some documents left behind by a deceased land owner. He quickly discovers that the village is being terrorized by a scorned woman’s vengeful ghost. This was Radcliffe’s first film after the Harry Potter franchise. While weird to see him as anyone other than Harry, he did a great job! The movie scored a 6.4/10 on IMDB and 66% on Rotten Tomatoes. Krampus is a 2015 comedy, fantasy horror movie that is based on the eponymous character, Krampus, from Central European folklore. While young Max Engel (Emjay Anthony) has the holiday spirit, the rest of his dysfunctional family does not. This leads to Max turning his back on the Christmas holiday, which accidentally leads him to unleash the wrath of Krampus, an ancient demonic force. Surprisingly, this holiday horror did pretty well with critics, scoring a higher-than-average 6.2/10 and 65%. We can’t really talk about movies like The House with a Clock in its Walls without mentioning Goosebumps! In fact, when I saw the trailer in the theater, I thought it was actually for the second Goosebumps movie! In the movie, a teen teams up with R.L. Stine ‘s daughter to stop demons that escaped from the famous horror writer’s imagination. Keep an eye out near the end of the movie, though, for a special cameo appearance by the real author! Rotten Tomato critics gave it a 76%, while IMDB fans only gave it 6../10. I give it a solid 8.5/10! With a great mix of fantasy & horror, you shouldn’t have any trouble finding a few movies like The House with a Clock in its Walls to hold you over until the release date! My personal favorites: Goosebumps and Stardust! What are your favorite movies like The House with a Clock in its Walls? Tell me below!